A similar example is provided below for a 100-room limited service hotel located in the Suburban Boston Hotel Market. 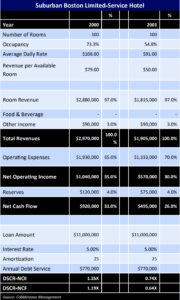 In this example, based on the 2000 suburban market occupancy rate of 73.3 percent and ADR of $108.00, an $11.0MM hotel loan was underwritten with the same interest rate and amortization as example I in the Part 2 series of this blog series. The income and expense statement of this hotel with these operating metrics is summarized below. Additional revenue assumptions include $90,000 in other revenue from miscellaneous sources. The example assumes the limited-service hotel achieves a net operating income ratio of 35 percent in 2000. Also, a deduction of 4.0 percent of total revenue is reflected for Reserves. (DSCR) of 1.35X based on NOI and DSCR of 1.19X based on NCF. Using the market performance metrics, in 2003, after the hotel experienced a 37 percent decline in revenue, Total Revenue falls to $1,905,000 with NOI of $570,000 and NCF of $495,000. The operating expenses of the hotel were adjusted to reflect the impact of lower occupancy on direct room related costs. The NOI margin was reduced to 30 percent. As a result of these assumptions, DSCR levels are reduced to 0.74X and 0.64X based on NOI and NCF, respectively. Based on these assumptions, the 2000 loan would have to have been underwritten at $8,150,000 (26 percent lower amount) with a NOI DSCR of 1.82X to achieve breakeven NOI DSCR in 2003. The loan would have to have been underwritten at $7,050,000 (36 percent lower) with a NOI DSCR of 2.10X to achieve breakeven NCF DSCR in 2003. It is acknowledged that this example utilizes an unusually deep hotel recession, with the goal of demonstrating the high potential volatility of hotel cash flow and the dramatic impact on debt service coverage. If you missed Part 1 or Part 2 in this series, you can view them here. Stay tuned for our final installment next week with Eight Best Practices in Hotel Underwriting and Risk Management. If you have questions or concerns about hospitality loans we would love to chat with you more. Our credit underwriters are experts and can aid and guide you through building or updating your hospitality lending guidelines.